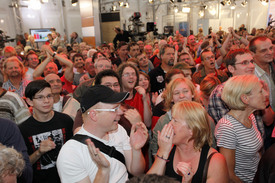 BERLIN – Many in the media complained that the just-concluded German election campaign was dull. After all, the two main opponents had worked in a coalition for four years together and generally agreed or compromised on most issues. Dull or not, however, the Sept. 27 vote had three important results. Angela Merkel of the Christian Democratic Union (CDU) will remain in office as chancellor, but no longer as an unhappy senior partner with the Social Democrats, once her party’s main rivals. In the future, her party will share cabinet seats in a new coalition with its favored partner, the Free Democrats (FDP), who stand even further to the right on most issues. Although the FDP is the party of businessmen and conservative professionals, its leader, Guido Westerwelle, has been making all kinds of promises to the voters in his smiley manner, and somehow they turned out to be convincing to about 15 percent of the voters, their record thus far. Since he will probably be the next foreign minister, the whole world may get the chance to enjoy his self-confidence and smeary smile. It was especially broad after the elections; it was the many votes for his party which will permit Merkel to stay in office. Her own party, though still ahead of the others, took a bad beating at the polls. Its losses, though serious, were not nearly as damaging as those of the Social Democrats, which lost over 11 percentage points, getting its worst results since World War II. The party is now down to about 23 percent. After 11 years in government it must now get used to the harder, colder seats on the opposition side. The disaster resulted from its policies of hitting out at working people, small business people and the jobless while cutting taxes on the super-rich and the corporations. True enough, the three other main parties had joined it in backing these policies, but it was the Social Democrats’ customary supporters, working people and the jobless, who were most disappointed at its betrayal. They did one of three things. They fell for Guido Westerwelle’s beaming grin and promises, partly because his party has not shared government responsibility for many years. Or they simply stayed home and enjoyed the wonderful post-summer weather in the park or countryside without bothering to vote. Or, a third option, they voted for the Left. This helps explain both the low turnout and the third main election phenomenon. The Left, still gaining strength in western Germany, jumped from a national total of 8.7 percent in 2005 to nearly 12 percent this time, increasing the number of deputies it sends to the Bundestag from 54 to nearly 80. All three of the smaller parties gained from the great distrust of both the CDU and the Social Democrats and can rejoice while these two major parties which shared in government for the past four years now lick their wounds. The biggest gainers, the Free Democrats, will now move into the cabinet of Angela Merkel’s government, which it rescued. The Greens finally won double-digit results, at 10.7 percent, but will be in fifth and last place in the Bundestag behind the Left, whose gains would seem to be most significant. Until now the Left was almost alone – except for a few mavericks from other parties – in opposing the military adventure in Afghanistan. The other parties had spited the wishes of a solid majority of the German public by sending in the troops. Only the Left fought brutal cuts and pressures aimed at the jobless, presumably to cut unemployment but only increasing it or forcing people into miserably low-paid dead end jobs. The Left was alone in opposing the raising of the pension age from 65 to 67 at a time when almost no one over 50 can find a job. None of the others supported its opposition to tax cuts for the wealthy – while increasing a values added tax which hit low incomes worst of all. Members of the Left were always treated like dirt, or ragamuffins, labeled either as unrepentant communists from East Germany, most likely with Stasi roots, or as wild radicals from the West, and alternately attacked or ignored in the media. No respectable politician liked to be seen anywhere near them. But the new government soon to be formed will mark a further turn to the right, almost certainly pushing the drastic measures against labor which the Free Democrats have been preaching, though hitherto in rosy metaphors. All Germans except the wealthiest should be prepared for many a crucial struggle to protect living standards. The Left, till now almost alone in its vigorous resistance to such measures, has now strengthened its positions and can fight better than before. But if the other opposition parties, the Greens and now the Social Democrats, still treat it as a bunch of “Schmuddelkinder,” – irrelevant ragtags – this defense will be much more difficult. During the election campaign both those parties sounded increasingly militant in their demands and promises. They were clearly trying to stanch the hemorrhage of disappointed voters by stealing the demands of the Left. What will they do now? In the face of the menaces from a right-wing government, will they agree to cooperate? Gregor Gysi, the prominent Left leader, warned that Social Democrats must basically alter their positions on key issues like creating jobs, fair support for the jobless, lowering the debt by taxing the super-rich and rejecting military adventures abroad. Only then can there be true cooperation, perhaps even in future elections. But this would require big changes within the Social Democratic party. Perhaps their disastrous showing will force them to draw the same conclusion. Three election footnotes are also worth mentioning. Separate provincial elections were also held in two German states on Sept. 27. In Brandenburg, once in East Germany, the Left maintained its strong second place, only five points behind the leading Social Democrats, in what is now virtually the latter’s last remaining stronghold. The minister president of the state in the capital, Potsdam, needs a partner to achieve a ruling majority. Will he stick to his current partner, the Christian Democrat Union, which once again came in third? Or will he dare to defy the hate campaigns and invite the strong Left to join him in Brandenburg’s government? He must decide quickly. In the northernmost state of Schleswig-Holstein, on the border of Denmark, it looks like a shaky coalition of Christian Democrats and Free Democrats, the same coalition as on the national scale. In any case, the Left – despite severe inner quarrels – won 6.6 percentage points, enough to gain seats in the state legislature for the first time. It is now represented in 12 of the 16 German states. Its vigorous opposition to anti-social programs is feared in nearly all of them. One final bit of news is very welcome: The neo-Nazi party which formerly had seats in the Brandenburg legislature has now lost them. It received hardly more than 1 percent of the vote.